OS Calculators Confuse Reality | OhGizmo! Sometimes, for chronic computer users like myself, it’s hard to differentiate between the digital world and reality. If you’ve ever done something really really stupid and then noticed your fingers unconsciously pressing control + z, you know what I’m talking about. This issue is made substantially more complicated by these calculators, which are modeled on the little calculator apps that come with your operating system unless you use something cooler like Linux. 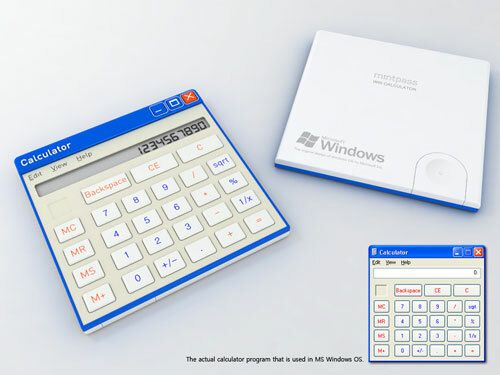 These calculators are currently a concept from Mintpass, and their designer rightly points out that the chances of them ever getting produced is rather slim considering who owns the actual designs, but he envisions them being made as trade show handouts or something… We’ll let you know if we see any at CES in January. And I just have to wonder what, exactly, is supposed to happen when you press that bright red button in the upper right corner… If it’s as faithful a reproduction as it looks, it probably causes the calculator to self destruct. Speaking of Linux, remember when he and Charlie Brown got lost in the Grand Canyon and the little Indian boy helped them find their camp? Oh and remember when Charlie Brown and Linux were shipwrecked on the uncharted Island? Speaking of good times, remember when Thelma asked Linux to paint a picture of Charlie Brown for the community center auction? This is pretty cool, and I would love to see these actually produced. I would so love to have one. (windows please) lol And I would hope the [x] button is to turn it off and not explode. I think I'd cry if it did… that or buy a million of them. Nothing can contend with my solid TI-89! Not even Windows Calculator. RAD! I would love to have something like this. Would I use it, no. This is less capable than the calculator on my BB.